The exponential function f (x) = ax (a > 0, a ≠ 1) is thus defined for all real x; its domain is the set of positive reals. The graph of y = ax, when a = 2, is shown in Figure N1–8. Of special interest and importance in the calculus is the exponential function f (x) = ex, where e is an irrational number whose decimal approximation to five decimal places is 2.71828.
y = loga x if and only if ay = x. The domain of log a x is the set of positive reals; its range is the set of all reals. 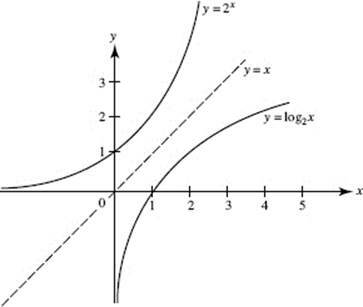 It follows that the graphs of the pair of mutually inverse functions y = 2x and y = log2 x are symmetric to the line y = x, as can be seen in Figure N1–8. log e x = ln x.
Logarithms with base e are called natural logarithms. The domain of ln x is the set of positive reals; its range is the set of all reals. The graphs of the mutually inverse functions ln x and ex are given in the Appendix.